This year my kids are being offered a couple different foreign language options at co-op, and my 3rd grader is taking Spanish the first semester. 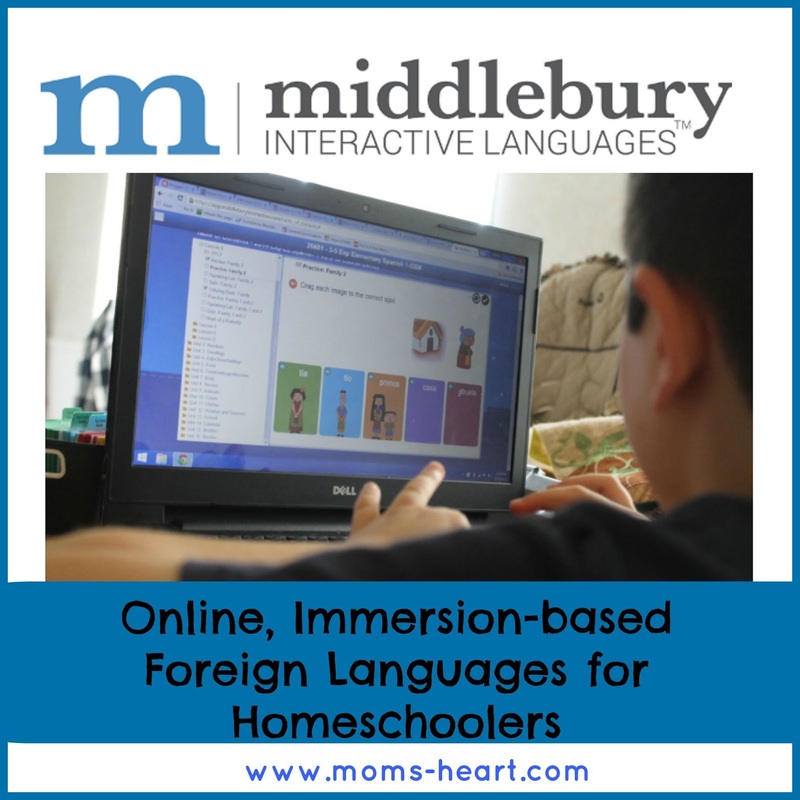 I want him to have a lot of experience and reinforcement with the language, so I was thrilled to be offered another review opportunity from Middlebury Interactive Languages. This year we're reviewing Elementary Spanish 1: Grades 3-5 and I was interested to see how it would compare to our experience last year. Middlebury Interactive Languages offers online, immersion style courses for students of all ages, in a variety of languages. Last year we reviewed the first semester of Elementary Spanish for K-2, and I had the option of continuing with the second semester, or bumping him up to the more advanced course. After discussing it with Elliott, we decided we wanted to try the 3rd-5th grade course. It appeared the upper level course would have similar material, so the familiarity would boost confidence, but it would take it to a deeper level, and I knew it would challenge him more. For the purpose of the review, I was given six months of access in order to review the first semester of the course, using it approximately three times per week. This is a good pace, and I've found 3-4 days a week perfect for our needs. The website is easy to navigate, and Elliott goes through the course while I'm nearby. I like to be within hearing distance so I can work with him on pronunciation if necessary. The first semester covers vocabulary and basic sentence structure for common topics, such as family, numbers and greetings and other topics that would be of use and interest to elementary age children. There is an authentic story/tale in Spanish, and a cultural lesson for each unit so this course would also compliment a geography study of Spanish-speaking countries very well. You can access PDF files with translations for the vocabulary, stories, and songs, so if you want to go over the context of the story and songs first, you can use these with your students. I find that Elliott likes a brief overview of the stories that are told in Spanish. He said otherwise he is only able to pick out the vocabulary at first, and he wants to follow the whole story. We still find the course fun and interesting! The graphics are cute, the stories are interesting, and the activities are varied. Sometimes he works independently on the computer, but sometimes we cast the lessons to the TV and the little kids follow along for fun. How Do K-2 and 3-5 Courses Compare? Both Spanish K-2 and Spanish 3-5 are Introductory courses, which means they require no prior knowledge or experience with the language. I wanted to share how the two compare, in case you have children of different ages or you have have a student working somewhere between a 2nd/3rd grade level and aren't sure where to place them. In K-2 Spanish, it is basically vocabulary acquisition. In the upper level course, students are not only taught the vocabulary, but are asked to put it into practice in a way that applies to the student. For the topic of Family, older students are expected to learn a few additional vocabulary words, as well as to speak full sentences, ending with a quiz that has them recording a sentence in Spanish that states who lives in their casa. The unit on Numbers for younger students is basically just counting 1-10 in Spanish, while older students also learn the vocabulary for zero and numbers, how to count backwards from 10-1 and practice their phone number in Spanish. So yes, some of the vocabulary is the same, but the 3rd-5th grade does dig a little deeper into the material. This has been a great review for Elliott, as well as giving him new material, and I love seeing him put to practice what he knows in a meaningful way. While the units in the two grade levels are similar, they do not line up, so you could not put a child in K-2 and a child in 3-5 and have them working on the same material/vocabulary at the same time. I know as a parent with children in different grades who like to cover the same topics, it would be nice to have them doing comparable vocabulary, at their own level, but it wouldn't necessarily work out that way with this program. What I like about this course is that the online/audio/video nature of this course allows my 1st grader to tag-along and learn a little with his older brother. However, the program only allows for the grading of one student, so siblings can follow along and learn too, but their progress isn't tracked, unless you purchase for multiple students. I think this program is great. It teaches through repetition and immersion, using stories, songs and simple computer activities. It is interesting for my son, and we're learning the basics of speaking Spanish and the Spanish culture together. I definitely plan to look into this program for high school to meet foreign language requirements, when that time comes. Middlebury Interactive Languages offers online language learning for elementary, middle, and high school levels in Spanish, French, Chinese and German, and even offer AP courses for some languages. You can check out their website for more information, and be sure to read more crew reviews, as everyone reviewed a variety of grade levels for all four languages. Recently my husband decided he wanted to spend a weekend in the mountains. Just a quiet, secluded little weekend getaway for the family. It was nice to spend a a couple days without the computer, without neighbors, without his phone going off constantly for work. It was nothing fancy. Just a cabin in a state park about three hours away. He booked a couple months ago, and I was hoping to see the fall foliage. While the leaves weren't quite turning just yet, it was still pretty, but also warm enough during the day to feel like perfect weather inside the forest. We spent most of our time just lounging by the fire, playing games, grilling out and relaxing. I loved sitting on the front porch reading while the kids played outside. Of course we got out and enjoyed the awesome weather too. We took the kids to the playground a couple of times. None of the playgrounds we frequent at home have a merry-go-round, so I think this was a first for my kids. A see-saw is another thing we don't see often. They enjoyed this too. Behind the camera for much of the trip . . . mommy and Eloise . . . she did swing on the baby swing on another trip to the playground, and she LOVED it! For our nature walk, we picked the nature trail based on descriptions. The one we chose was the shortest length and was described as an easy after-dinner walk with mostly level terrain. Or something along those lines. I was thinking mostly a basic walking path that maybe circled the cabins or something. Mostly straight and flat like it started out . . . But then we crossed a bridge . . . It was a little more "intense" (for my little ones anyway) than I was expecting. There were a few steep climbs and a few stretches of very narrow paths squeezed between a hill and a drop-off. You can't really see in the picture, but it would have been a long tumble for a little kid. Or for mommy wearing a baby. All in all, we had no major tumbles. It was nice to take our time and enjoy the natural beauty all around us. Elliott liked looking for the path markers and signage on the plants. And of course, every boy needs a stick. What a face, what a face! She was so proud of herself every time she went over a log by herself! There were a lot of fallen trees, but a friend of ours said the derecho from a few years ago really did a number on their trails, so that could have been part of it. Everyone got to take a ride at some point. She had to go UNDER too! It reminded me of We're Going on a Bear Hunt, which would have been a cute book to row with Eleanor before the trip (or when we went on a cave tour the week before!) but maybe next time. The boys did row Daniel's Duck though, which also tied in nicely. If I've said it once, I've said it a dozen times. I've got a kid that loves games. So yes, when given the opportunity to do a review for USAopoly, a company that produces favorite board games and puzzles, I jumped at the chance! We received Wonky: The Crazy Cubes Card Game and Tapple: Fast Word Fun for Everyone to play and review. To say my 8 year old was thrilled would be an understatement. Wonky is a tower-building game that requires patience! It consists of a deck of specialty playing cards and 9 cubes of different sizes. There are three large, three medium, and three small cubes. Essentially, you are dealt a hand of cards and you play a card, stacking the designated block on the tower. Sounds easy, right? Except the cubes actually have uneven or wonky sides! Since you can only play a cube based on the cards you hold, you may have to place a large cube on a small cube, you may have to draw more cards, or you might have to skip a turn or reverse play! The object of the game is to be the player who stacks the last block on the tower, or the first player to play all of their cards. We had only played a few minutes when my game-loving junkie yelled out "I love this game!" The recommended age range is 8+, but it's fairly easy to learn, and non-readers can use the pictures on the cards to play as well. The age recommendation is probably more for patience and motor skills, because younger kids are likely to get frustrated when they make the tower fall, and they're more likely to bump into the table. We've had a lot of fun with this game, and I am thrilled to have it in our game closet! Tapple is another exciting game! The game consists of the Tapple Wheel, which has a timer and 20 letters (Q, U, V, X, Y and Z are omitted), and 36 game cards. Batteries are required for game-play. Simply put, you start by choosing a card. The cards have an "easy" and a "difficult" side, and each side has two categories. You pick a category for that round, and then on your turn say a word that starts with any letter on the wheel that hasn't been used and tap the letter before your time is up! It's a fun, competitive, exciting and fast-paced game! It's also aimed at ages 8+ and suggested for 2-8 players. We've been playing with 3 people (mom, dad and 8 year old) and we've had a blast. There are more suggestions on the website for playing with younger players, adding more educational twists to the game, playing on teams, and even more playing categories. This game has a lot of potential for variety and personalizing for your family. These are excellent games. They appear to be high quality, although we've had a little trouble with one letter on Tapple not wanting to remain depressed. It may take several tries for the player to get it to stay down, or it might pop back up, which means the letter appears to still be in use. This is a little distracting, but overall we've still enjoyed the game. Both games are fun and require a variety of thinking skills, so even though they're top picks around here for family-night, they offer educational value as well. For individuals or families that enjoy games, these would make great gifts. They'd be fun for classrooms or co-ops who use games for small group activities as well. I would certainly recommend both of these games to family and friends! 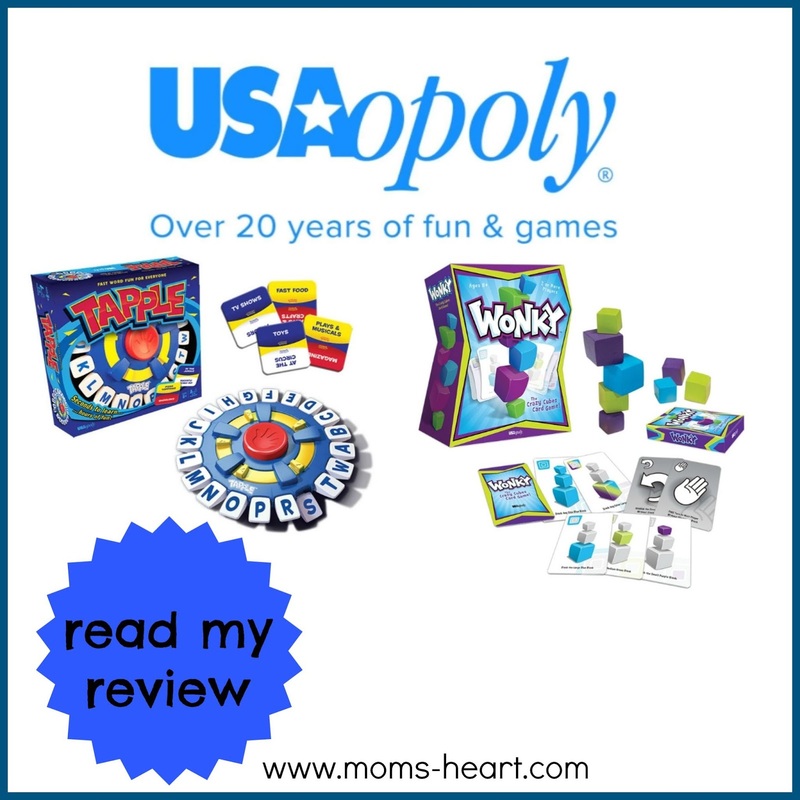 Be sure to find out more about Wonky and Tapple, as well as other USAopoly games, and definitely read more crew reviews to see how much fun other crew members have had with these games! The husband and I were looking for some quinoa recipes, and a friend shared a kale and quinoa salad recipe. Of course I adapted it to what I had on hand, so it's basically a new recipe, but it was very good. *I added corn to the recipe after Friend mentioned she sometimes uses it, because we like a lot of color and texture in our salads. I used a bag of frozen corn because that's what I had, but a can of whole kernel corn (drained) would work, or you could use fresh corn, cut off the cob. 4. 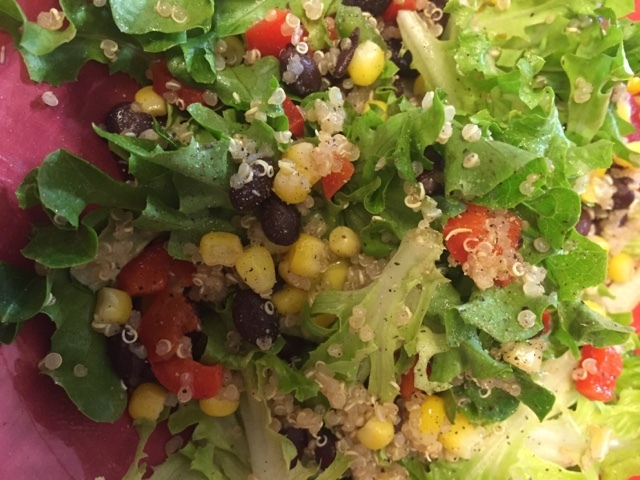 Toss salad greens with some of the dressing, then add beans, corn, quinoa and bell peppers. We really liked this. It would be delicious with fresh summer veggies, and makes a good "Meatless Monday" meal. It's also very easy and quick to prepare, and it's healthy, so it's a great last minute, no-fuss meal. Later that night I even snacked on what was left the main ingredients (no lettuce) all mixed together, and that tasted good too. I'll definitely be making this again and experimenting with flavors with this one! I'm still looking for good quinoa recipes, so if you have any, please share! It's hard to describe our homeschool style but when I look at what we do, we love literature and hands-on activities. These are great ways to learn, especially in the early elementary years, but it doesn't leave much tangible proof of learning for our portfolio reviews. Something I like to do is find interesting, interactive and engaging "worksheets" for the kids. This gives them a chance to review what they've learned, and gives me a paper trail of our lessons. Recently I was given an Individual Membership to a website called Super Teacher Worksheets and I was hoping this would be a one-stop-shop for supplementing our core curriculum. As you can see, there are worksheets for all of your core academic subjects, and there's more! There's so much depth in those individual categories, that I could never list all of the subtopics covered; you really have to look through them to see how much content is available. The Teacher Helpers include things like certificates, lesson planners, book logs, and much more. The Make Your Own Worksheet section gives you the ability to create math fact worksheets, flash cards, word searches, crossword puzzles, quizzes, and other types of worksheets. You can also save things you generate to your filing cabinet. Essentially, if you can't find what you need, you can probably make it yourself with little effort. The one exception is that I couldn't find a handwriting worksheet generator, which would be nice for creating custom copywork pages in print or cursive for the boys. Since handwriting generator websites exist out there for free, I would love to see one added here, so I could get everything done in one place. I decided the primary way I want to use Super Teacher Worksheets is to help me plan ahead for our unit studies. I'm not a huge planner by nature, but I realize that having things outlined ahead of time keeps us consistent and on track. So as I plan each unit, I check Super Teacher Worksheets for corresponding worksheets. I've found so many great things for recent and upcoming units. I just print and file with my planning sheet, and I'm ready when we start the unit. For instance, when we read Paul Revere's Ride and did an overview of the American Revolution, I found a colonial map and a patriot soldier that were suited to our needs, among many other relevant worksheets. This year we have a weekly afternoon co-op, so those mornings will be different. I'm using that day each week for a "catch-all" day, which is where we do review, critical thinking, and other subjects that don't need to be covered daily, but that need to be worked into our schedule. Super Teacher Worksheets has a huge variety of supplemental activities that are perfect for the boys. I've printed several puzzles, brain teasers, word problems, in and out boxes, reading comprehension and other exercises. I put them in a folder, and each week I can pull out whichever activity I feel is most appropriate. I know I can also go on the website and find a worksheet to supplement a specific topic in their math or language arts programs if necessary as well. For instance I printed a blank Multiplication chart for my 8 year old, since that is his primary focus this year for math. He is filling in each set of facts as he learns them, which is great review. You can also preview each worksheet before you open the PDF to download/print. I'm certain I'll be using some of the other multiplication items with my oldest this year too. Multiplication Bingo, Memory Match and To The Moon sound like a much more fun way to review than drilling repeatedly! You can save your favorite worksheets. This is great for ones I'm likely to use repeatedly, like the United States map as we study different regions. The filing cabinet is also be good for saving worksheets "for later" when I'm not ready to print but don't want to hunt them down again. I can sort them by subject too, which makes it easier to find later. This is a thorough website and I'm very happy with it. I do wish there was a quick-pick type menu at the top to navigate to subjects a bit faster. Maybe a drop-down menu, because right now you have to scroll down, sometimes all the way to the bottom, and then click "more" to see whole subject categories. There's so much here, that I rarely have to look elsewhere for what I need. I love that they offer a unique variety of interesting printable material, not just standard fill-in-the-blank worksheets. They have mini-books, word wheels, games, flashcards, cut-and-paste, puzzles and so much more than I could possibly list. It's definitely worth the subscription ($19.95/year) considering you get so much offered in one spot. I love that I don't have to pay for individual items like on some other websites. They also offer many freebies in different categories, so it's worth checking out their free worksheets to get an idea as to the variety of their offerings. For more information, find them on social media, and read the other crew reviews! Paul Revere's Ride by Henry Wadsworth Longfellow is a poetic and romanticized version of the story of Paul Revere. This was a casual row, as I planned it last minute. We mostly focused on the history for this unit, but we touched on the other subjects as well. I loved the simplicity of the manual's recommendation for the timeline. At this age, it's not about specific dates, but rather the sequence, importance, and the ability to connect meaning between them. We also started watching Liberty's Kids during Eleanor's quiet time. I found this Map of the 13 Colonies on Super Teacher Worksheets (review coming very soon!) and we marked Massachusetts. All of the original colony! We had to move Ducklings over to make room, but I like to see our map filling up! Due to the time period and setting of this poem, there was quite a bit of vocabulary that we discussed. The manual has several suggested words to cover, but we covered the ones they asked about when the questions arose. I think learning new words in context is the best way to expand vocabulary, and all of my kids have had excellent vocabulary and comprehension since they were toddlers, so it's the way we will continue to do things for now. This was the first poem we've done for Five in a Row. The syntax and flow of the poem, the vocabulary . . . it all made it a harder read, particularly that first time through, but we persevered. The kids weren't fond of this particular poem, but we've had success with poetry in the past, and they did like the actual story, so overall it was worth the effort. I think it's important to include poetry regularly, so I don't regret doing this book when we did. I mentioned in my original Five in a Row plans that I would be utilizing other resources for Elliott since he's on the upper end of the age range for FIAR. We are reviewing the Sam the Minuteman Study Guide from Progeny Press, which included reading the book by Nathaniel Benchley to everyone. We discussed a couple of the art lessons one afternoon, but the boys were not interested in pursuing their own interpretations. In all honesty, the boys have not been enthusiastic about most of the Five in a Row art lessons. They prefer ARTistic Pursuits or Art for Kids Hub. I will keep trying, but I won't push it if they are still getting art instruction elsewhere. The science lesson on fog was a little basic, and it's something we see naturally behind our house, so it was a good talking point, but nothing extraordinary. However . . . we got to some interesting, even if unrelated, science in a round-about way. During one reading of Paul Revere's Ride we somehow started talking about George Washington, then Benjamin Franklin, then electricity, and then powering a city with a giant potato. . . you know how the minds of little boys work! Later Elliott asked to do another treasure hunt. I happened to have the Multiplication hunts left, and that's what he's doing in math, so that part worked well. I split the clues as fairly as I could, giving Emory the easier ones that involved hidden pictures or drawing the answers, and Elliott doing the more mathematical clues. I was also able to tie it in with this row because of the riddles (math) and signals/secret messages (social studies) lessons from the manual, so it was good timing all around. What did this have to do with science? Nothing related to the manual or the row. Only the conversation about electricity and potatoes! We happened to have a potato clock kit put back, so that was the "prize" for the treasure hunt. Emory answered the last riddle to find the prize, and laughed, slightly maniacally, when he realized what the prize was. He was the one wanting to power a city with a potato. I have to say, it's always interesting to see where these rows will lead us! The next row I'll be sharing is Daniel's Duck, as we had a fun weekend trip to a cabin in the mountains planned! When the boys were rowing The Bee Tree, I decided to find related activities for the preschooler, instead of doing a separate unit. It was very easy to include Eleanor this way, so she focused on the Letter B, the /b/ sound, Bees, hexagons and black and yellow. We colored this B is for Bee coloring page together. She also colored a mini book of Bees (and Bugs) that we made on Twisty Noodle. The bingo markers are a fun treat, and she did great on this do-a-dot maze. She really enjoyed following the path and never went out of order. It was really fun watching her do this Flight of the Bumblebee Tracing, and how she interpreted what she thought she was supposed to do for each line. The boys were learning about hexagons for math, so she did too! She played with the pattern blocks and filled in the bee while I cut out the shapes. Then she glued down all the shapes in the right spot. I had plenty of the paper blocks that I printed for the boys and their hexagon activity, so this was a good way to use them up. This was a lot easier for her than I expected it to be, but it was a great opportunity to name the shapes. Then we played with a spider. Because it's a bug too. Plus it has glowing eyes. We sang "I'm Bringing home a Baby Bumblebee" multiple times, and everyone listened to Flight of the Bumblebee once. She found a paintbrush and wanted to paint, so I gave her yellow paint and a bumblebee to paint and she went to town. She and I also made the B - Bee Craft for the front of her little folder. We still only do "preschool" a couple days a week, so this was stretched out over two weeks. It's casual enough for my preferences, and she can still get her Preschool fix and have fun with us.